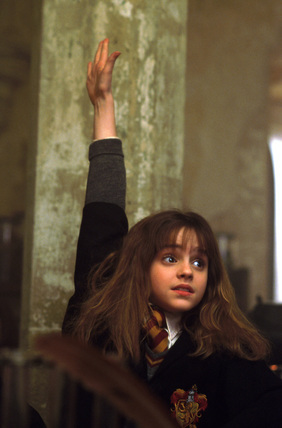 The most common, and maybe the very worst, teaching technique is to say to students “Hands up if you can answer this question”. This is because the same (confident and able) students end up hogging the lesson and the rest of the class simply falls below the radar: either happily (because they’d rather have an easy life) or unhappily (because they might like to get involved but lack the confidence of the others). Put simply, the act of raising a hand requires a degree of self-confidence that many able but shy students – especially younger ones – lack. And if the teacher chooses to ignore the students straining with their hand in the air to encourage a less confident student to offer an answer, a sense of injustice and resentment can result. With this in mind, last week I tried a new approach. Instead of asking students to raise their hand when they DID have something to contribute, they had to raise their hand to express that they DID NOT have anything to say or to ask. This required me to re-frame my questions: instead of “Who can tell me…?” I asked instead “Who is NOT able to tell me…?”. I then had to choose the students who had not raised their hands. This rather flummoxed the class to start with, but in a good way. Those students who wished to stay ‘under the radar’ now had to counter-intuitively raise their hands; those students who usually hogged the discussion had to keep their hands down; but so too did the more shy students who felt they knew the answer. I could then ask those students to contribute their points without the more pushy students feeling that they had been unfairly ignored. I developed the technique in a later lesson. I realised that if I framed a question in such a way that is highlighted ignorance, then of course nobody was willing to raise their hands (“Read through the following passage. If there are any words you don’t understand, raise your hand and I’ll explain them”). So once again I reversed the question. I placed the students into small teams, then encouraged them to read closely by asking the following question instead: “Raise your hand in a few minutes if you are confident you can define ALL of the words in this account. Points will be *given* to any students who can identify a word which NOBODY in the class can correctly define”. All of a sudden, students were SEARCHING for words that they did not understand with enthusiasm instead of trying to hide their lack of knowledge and understanding. I plan to use this technique much more regularly in future. The traditional ‘hands up’ strategy is so innate to teachers that I for one have not reflected on how limited and ineffective it actually is.